I love Indian summers, they are just so pretty. This year it seems even more welcome as summer-proper was so rubbish. I am feeling quite upbeat and in the mood to make jams and pickles. I recently had a small stall at Transition Kentish Town's Urban Harvest Festival with a selection of easy preserves to make with windfalls or foraged fruit, as well as gluts of vegetables. I was amazed at how much people liked them. I was letting people taste the preserves, yet they wanted to pay me. Blimey, I thought to myself. I ended up just giving it a way. Karma, baby (I hope!) I am not planning on going into business quite yet, but it was very gratifying. 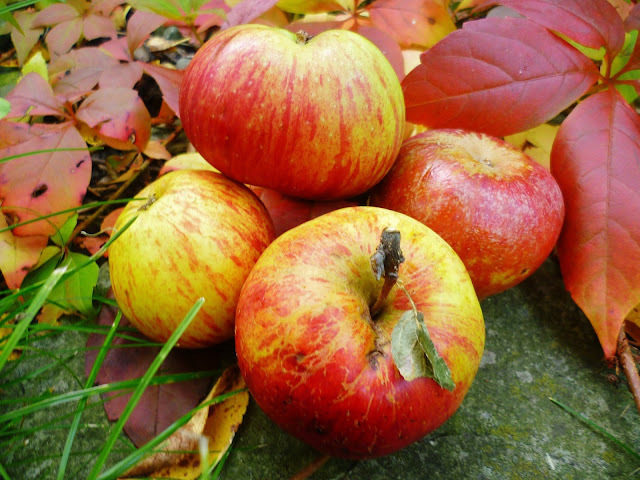 It really is the time for all those early autumn fruit and vegetables such as apples and pears and perfect British root vegetables such as Jerusalem artichokes and celeriac. Of course this is the best time of the year for foraging mushrooms, or even just letting someone else do the work for you and buy the results at the local farmers' market. It's a great time to make preserves as I've mentioned, from plum jam to damson gin, raspberry jam to chutneys and pickles. The first Bramley apples are now in season, as are plums and pears. And don't forget this is the beginning of crumble season! The Jerusalem artichoke season is just beginning and cauliflowers are at their peak, together with main crop potatoes and carrots, sprouts, and broccoli. Lettuce is running out by the middle of the month, and courgettes finish towards the end. But by the end of the month, pumpkins and squashes will be piling up (and I do like my pumpkin soup. Actually I love my mushroom soup too . . . perfect for the cold, damp evenings which are slowly sneaking up on us). Should you be celebrating Halloween this year, can I recommend some vampire bat wings with blood dipping sauce? They are delicious (and not bats were harmed!) Last year I also made a witches' brew soup. It looks suitably ghoulish (full of intestines and skulls), but it is really a hearty winter warmer of pea and ham and a few added extras (such as coloured pasta tubes and mushroom "skulls").